ed by unique keys. No operations span multiple data items. gured per-instance. Each key k is assigned to a coordinator node. The coordinator is in charge of the replication of the data items that fall within its range. In addition to locally storing each key within its range, the coordinator replicates these keys at the (N - 1) clockwise successor nodes in the ring. This results in a system where each node is responsible for the region of the ring between it and its Nth predecessor. As illustrated in the below figure, node B replicates the key k at nodes C and D in addition to storing it locally. 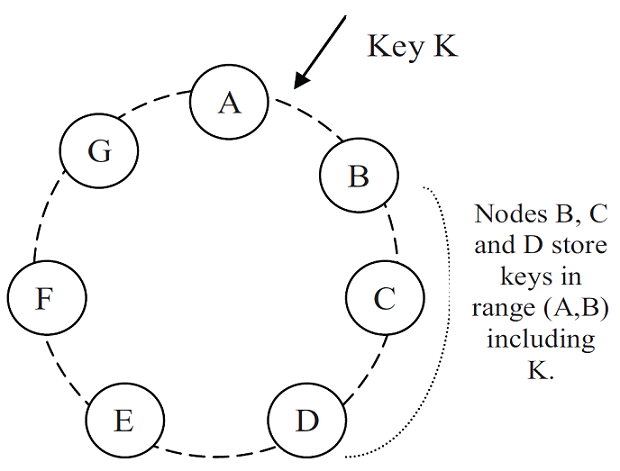 Node D will store the keys that fall in the ranges (A;B], (B;C], and (C;D]. The list of nodes that is responsible for storing a particular key is called the preference list. The system is designed so that every node in the system can determine which nodes should be in this list for any particular key.